Ds Louisa Townsend is in Fiji for a money laundering conference. From the moment she arrives in the country things go wrong, including someone breaking into her room while she sleeps and mucking about with her underwear. But that pales into insignificance when she stumbles upon the murdered body of a new friend. Louisa wants to help find the truth and the killer. But DI Vika, the officer in charge of the investigation, tells her to keep out of it. Louisa isn’t happy. The snooper is still breaking into her room, and although Louisa doesn’t know how or why, she’s sure there’s a connection between the break-ins and the murder. Determined to get to the truth, and with the help of Fijian colleague Constable Makereta, Louisa embarks on journey which takes her into Fiji’s underworld and fighting for her life. Louisa Townsend first appeared in Food of Ghosts back in 2012. She had moved from Edinburgh to work for the Kiribati Police Service on Tarawa, a remote coral atoll in the Pacific. 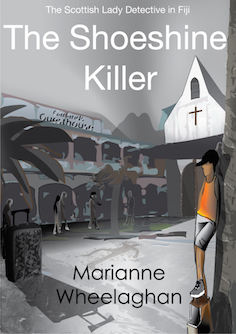 The Shoeshine Killer sees her travelling in Fiji for a conference. But she arrives just as a political coup has taken place, leaving her stranded along with a fellow traveller. They’re picked up by two (well-meaning) men form Australia and New Zealand who offer to share their hotel room until they can each get to where they’re supposed to be staying. Sharing a hotel room doesn’t fit easily with Louisa’s OCD, and neither does someone snooping in her room and rearranging her underwear. The next day, one of the men is found murdered, and Louisa becomes convinced that the two crimes are somehow connected. 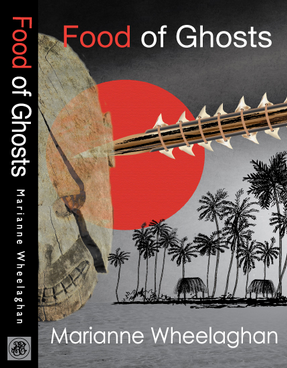 We’re in a different location from that of Food of Ghosts (barring a brief trip back to Tarawa), but the sense of place is no less keen. In fact, if forced to choose, I’d say I got a more detailed idea of Fiji from The Shoeshine Killer than that of Tarawa in the previous book. Either way, the evocation of her exotic settings is something that Wheelaghan clearly takes a lot of effort over, and it pays off, immersing you in the unfamiliar surroundings. The Scottish Lady Detective mysteries (as I believe the series is known) are a sort of more realistic Death in Paradise, and there are shades of Alexander McCall Smith in the often humorous, unfussy style of writing. It’s tempting to call the novel deliberately old-fashioned, and in many ways it is. However, when you drill down there are probably more contemporary elements than the opposite. 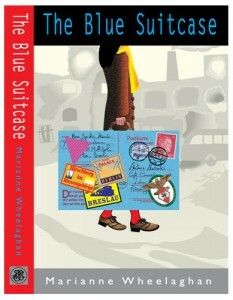 Louisa is a thoroughly modern heroine, and there are explorations in The Shoeshine Killer of child exploitation, religious homophobia and underworld violence that you can’t exactly imagine MC Beaton addressing. The Shoeshine Killer is an immersive, deceptively gritty mystery novel, and wherever Louisa Townsend is off to next, I hope we’ll be able to follow her. The Shoeshine Killer is out now as an ebook.